On March 6, 2008, the Florida Supreme Court sided with patients and consumers in allowing them to examine records on past adverse medical incidents. The Florida Supreme Court, in reviewing two lower court decisions, held that Amendment 7, the Patients’ Right to Know About Adverse Medical Incidents, was clear in its intent that patients have a right to have access to records made or received in the course of business by a health care facility or provider relating to any adverse medical incident. After the passage of Amendment 7, the Florida Legislature implemented Section 381.028, Florida Statutes in an attempt to preserve the confidentiality of peer review records created before the amendment was adopted. Numerous conflicting opinions from various Florida District Courts of Appeal arose in the courts’ attempts to reconcile the Amendment with Section 381.028. 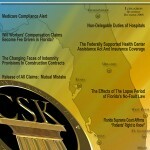 The Florida Supreme Court’s 2008 opinion in Florida Hospital Waterman, Inc. v. Buster 4 resolved those conflicts. This recent Florida Supreme Court decision substantially changes Florida law, resulting in a significant setback for health care providers. For decades, health care providers had relied on statutory discovery protections to protect the confidentiality of peer review information. However, the Supreme Court firmly held that Amendment 7 eliminated existing statutory discovery protections, leaving health care providers wondering what, if any, protections remain for the peer review process. In sum, Amendment 7 only applies to records. Amendment 7 does not eliminate the statutory immunity for participation in peer review activities and require the disclosure of the identities of peer review committee members, and thus, this information remains confidential. 1 Article X, Section §25 of the Florida Constitution. 4 Florida Hospital Waterman, Inc. v. Buster, 984 So.2d 478 (Fla. 2008). 9 Id. at 487 citing Notami Hospital of Florida v. Bowen, 927 So.2d 139, 145 (Fla. 1st DCA 2006). 10 Id. at 492 citing Notami Hosp., 927 So.2d at 143-44. 11 Id. at 493 citing Notami Hosp., 927 So.2d at 143. The Federally Supported Health Centers Assistance Act (“Act”) allows the United States to “deem” actors, agencies and employees to be part of the Public Health Service (“PHS”). Such “deemed” actors qualify for a type of limited insulation from suit under the Federal Tort Claims Act (“FTCA”). The facility, called an “entity” under the Act, and its employees enjoy the Act’s protection by being “deemed” employees of the PHS. A facility does not enjoy immunity simply by virtue of receiving federal funds. It must take affirmative steps to obtain immunity. This is done by applying to the Secretary of Heath and Human Services (“HHS”), who then makes the determination of whether or not the entity meets the requirements to be “deemed” a PHS employee. The relevant code sections specifically delineate four requirements for the Secretary of HHS to determine whether an entity should be deemed to be a part of the PHS: (1) the Secretary must find that the entity has implemented appropriate policies and procedures for reducing the risk of malpractice; (2) the entity must have reviewed and checked the credentials of its physicians and other health care practitioners; (3) the entity must have no claims filed against the United States as a result of this Act, or if so, the entity must have cooperated fully with the Attorney General and taken corrective steps to assure that such claims will not arise in the future; and (4) the entity must cooperate with the Attorney General and provide information that will help the Attorney General estimate the amount of claims that will arise during the year. In determining what action to take when handling a file that might involve FTCA protection, the insurer should make two initial determinations: (1) the insurer needs to consider whether the file involves a facility or an individual; and (2) whether the issue involved is a claim being filed or a simple evaluation of the insured’s coverage. The insurer should also realize how the FTCA affects the relationship between the insurer and its insured. The purpose of the Act is to eliminate the facility’s need for private medical malpractice insurance. However, facilities will still need “gap” insurance to cover those acts or omission outside the FTCA. Where an insured fails to properly obtain FTCA protection, a claim that could have been covered by the FTCA would then have to be handled by the insurer under any “gap” coverage. Additionally, any procedural miscue on the part of the facility that disqualifies an entity’s application, will preclude FTCA coverage for the facility and its employees. Therefore, the insurer has an incentive to make sure that the facility follows all the proper procedures for obtaining FTCA protection. Once an insurer handles a claim involving a health care facility, it is too late to seek immunity for a facility that has not been deemed a PHS entity by the Secretary of HHS. The insurer should contact the facility to determine whether it has been through the deeming process. If the facility has not been deemed, it of course will not receive FTCA protection. If the facility has been deemed, the insurer should make certain that the insured’s facility notifies the federal government of the adverse suit or claim. This should be done regardless of whether the claim is an actual suit or simply a notice of intent. If the insurer is not handling a pending claim or lawsuit, but rather is evaluating coverage, the insurer should find out if the facility receives federal funding that would qualify it for protection under the Act. If the facility meets the Act’s statutory requirements, the insurer should make sure the facility begins and completes the deeming process. There is no statutory protection until the deeming process has been completed. The insurer should further determine the portion of the facility’s services that will be devoted to federal health care and accordingly covered by federal funding. Such a determination allows the insurer to give the facility the appropriate discount on its premiums since a certain portion of medical services will be excluded from coverage under the policy. The Act covers acts or omissions, relating to the grant-supported activity, occurring after the date the entity becomes a deemed facility and related to the grant-supported activity. Determination of two key elements is essential to establishing facility coverage under the Act: (1) the date the facility was deemed an employee under the Act; and (2) whether the alleged act or omission that forms the basis of the claim is related to the scope of services funded by the grant. Any statutory protection is not retroactive and only applies to acts or omissions occurring on or after the date the Secretary deemed the facility to be an employee of the PHS. Even after a health care facility is deemed an employee of the PHS, the health care facility is not protected under the FTCA from all suits brought against it. The protection only extends to services related to the grant-supported activity. This is known as being within the “Scope of Project.” When a health care facility faces a cause of action, it must notify the Attorney General of the claim or lawsuit so that the Attorney General can determine whether the Act covers the particular incident. Once the Attorney General receives notification of a lawsuit against any entity or one of its employees, the Attorney General has fifteen (15) days to make an appearance in court to advise the court whether the entity or its employees are deemed PHS employees for the purposes of the acts or omissions at issue in the suit. If the Attorney General finds that the entity or its employees are PHS employees, such finding will satisfy the Act’s requirements that the Attorney General certify that the entity and its employees were acting within their scope of employment. Thus, the PHS employees would receive the Act’s protection. If the acts are not related to the federal funding, then neither the entity nor the individual will receive protection from the federal government. Conceivably, a physician who is not an employee of the health care facility may perform services related to the facility’s federal funding. If the facility had completed the deeming process, it should be covered by the Act; however, the physician would not be covered because he is neither an actual employee nor meets the requirements to be considered a contactor. A finding that the facility or physician is an employee allows the Attorney General to remove the case to federal district court, with the substitution of the United States as the defendant. At this point the United States will take over the case and the entity or individual’s involvement will be limited to cooperating with the United States in defending the lawsuit. The Act protects health care facilities and their employees by deeming them PHS employees, which means that the sole remedy against them is to bring suit against the United States pursuant to the FTCA. In cases involving deemed entities, even though the United States is substituted as the defendant, it is vital for a health care facility to understand how the FTCA works because the facility and its employees will often remain involved in the suit. In cases where the United States substitutes itself for an entity or employee of the facility, the original defendant will be expected to cooperate fully so that the United States can adequately defend the case. Moreover, in cases where a health care facility maintains dual coverage, the private insurer will have an additional interest in the outcome of the case because the United States may seek payment from the insurer for any judgment against the United States pursuant to a statutory right of subrogation. While the Act does provide some coverage/immunity for medical malpractice claims, a facility covered under the Act still needs additional insurance coverage for several reasons. Facilities will still need “gap” insurance to cover those acts or omission that fall outside the FTCA. Where an insured fails to properly obtain FTCA protection, a claim that could have been covered by the FTCA would then have to be handled by the insurer under any “gap” coverage. Additionally, any procedural miscue on the part of the facility, should it disqualify the application, will preclude FTCA coverage for the facility and its employees. Moreover, the Act only covers acts or omissions occurring after the date the entity becomes a deemed facility and related to the grant-supported activity. Any statutory protection is not retroactive and only applies to acts or omission occurring on or after the date the Secretary deemed the facility to be an employee of the PHS. Even after a health care facility is deemed an employee of the PHS, the health care facility is not protected under the FTCA from all suits brought against it. The protection only extends to services related to the grant-supported activity, and the determination as to whether the Act covers the particular incident is within the discretion of the Attorney General. Finally, it is possible for the Act to protect a facility and not cover a physician performing services at the health care facility. If the physician in question is neither an actual employee nor meets the requirements to be considered a contractor under the Act, then coverage would not be provided. 1 42 U.S.C. § 233(g)(1)(A). 2 42 U.S.C. § 233(g)(5). How Has The Medicare Secondary Payer Act Been Applied In The Workers’ Compensation Context? CMS has not yet clarified what procedures it will establish to facilitate the protection of Medicare’s future interests in general liability matters. Thus, it may be instructive to review what protocols CMS has implemented in the workers’ compensation context. In 2001, CMS directed parties to establish Trust accounts to fund the future medical costs of workers’ compensation claimants.3 These trusts are better known as Medicare Set Aside Trusts (“MSA Trusts”).4 To establish a MSA Trust, a workers’ compensation carrier must estimate the costs funding a claimant’s future medical expenses, determine whether to fund the MSA Trust via a lump sum payment or structured annuity arrangement, and determine whether to administer the MSA Trust through a third party or via self-administration.5 The goal is to utilize the MSA Trust solely to pay for future covered medical expenses. Through subsequent administrative memoranda, CMS established MSA Trust review thresholds for workers’ compensation cases. These thresholds provide that a formal MSA Trust should be prepared when (1) a claimant is a Medicare beneficiary at the time of settlement and the total settlement amount6 exceeds $25,000, and (2) the claimant has a reasonable expectation7 of Medicare eligibility within 30 months and the total settlement amount is greater than $250,000.00.8 While these thresholds do not specifically apply to liability, no-fault and self-insurers, CMS’ utilization of these thresholds in workers’ compensation cases suggests that these thresholds, or at least a similar approach, may be utilized when dealing with liability, no-fault and self-insurers. While the above thresholds are not required beyond the workers’ compensation context at the moment, we expect that CMS will likely implement similar threshold procedures to assist primary payers in determining when and whether a MSA Trust would be appropriate. What Is The Medicare Secondary Payer Act And Why Do Primary Payers Need To Know About It? 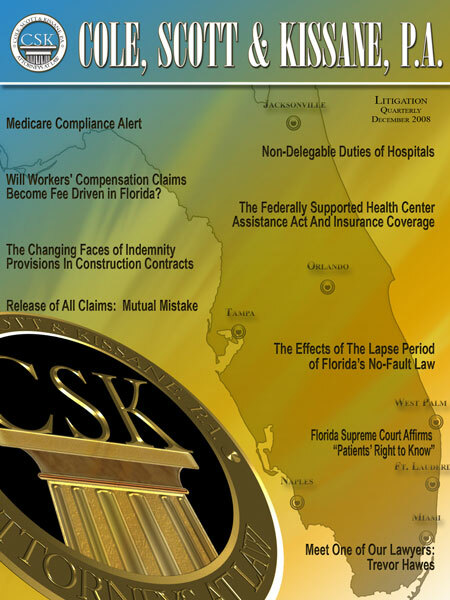 Starting on July 1, 2009, primary payers must (1) “determine whether a claimant … is entitled to benefits,” even if the claim is unresolved; and (2) report an extensive amount of data to CMS about these claimants in order to permit CMS to coordinate benefits.13 Failure to comply with these mandatory reporting requirements will result in penalties of $1,000.00 per day, per claim, for non-compliance.14 In light of these potentially crippling fines, the question faced by all primary payers is what steps should be taken to comply with the MSPA’s reporting requirements and avoid any financial penalties.15 In a nutshell, the answer is to (a) identify which insureds are eligible for Medicare, and (b) gather and report all information required by CMS. The remainder of this article will address both of these points. “[W]orking aged” persons over age 65 who are not eligible for either Social Security or Railroad Retirement Benefits who purchase Medicare coverage by monthly payment as active employees for an employer of 20 or more employees. Notably, the key question is not whether the claimant is actually receiving Medicare benefits, but merely if he or she is eligible for Medicare. If any claimant potentially falls within any of the four above categories, the primary payer’s obligation is to gather information about this claimant and report this information to Medicare. (7) information detailing any resolution or settlement of a claim, with a particular focus on explaining whether the claim was contested or not, and whether the primary payer has assumed ongoing responsibility for medical costs associated with the claim. While primary payers will be permitted to use agents, it is the primary payer, not the agent, who will be exclusively responsible for determining whether a claimant is eligible for Medicare and responsible for complying with the reporting of the above data. CMS plans to implement the entire Mandatory Insurer Reporting Process throughout 2009. On September 5, 2008, CMS released an Implementation Timeline, in which CMS revealed that it intends to develop the systems needed to facilitate mandatory reporting from January 2009 through June 2009.22 In May and June of 2009, primary payers will be expected to register online at CMS’s mandatory reporting website.23 Thereafter, CMS will test data submission at the website from July 2009 through December 2009.24 All primary payers (liability/self/no-fault/workers’ compensation insurers) must submit their first set of reports, which CMS refers to as “production files,” from October 2009 through December 2009.25 By January 1, 2010, all primary payers will have to submit their claimant data by that time.26 Notably, this timetable reveals that CMS does not plan to have its reporting apparatus in place until months after July 1, 2009. However, primary payers should comply with the July 1, 2009 deadline. To further explain the registration process, CMS released a set of Registration Process instructions on September 24, 2008. These instructions reiterate that all primary payers must register from May 1, 2009 through June 30, 2009.27 CMS also instructs all primary payers to assign an “Account Manager” who will serve as an administrative contact with CMS.28 The registration process will require each primary payer to provide information about itself, including contact information, lines of insurance, identification of its Account Manager and identification of any parent companies, subsidiaries or related companies.29 In addition, each primary payer will have to identify the approximate number of reported claims during the last calendar year that resulted in an actual payment to a claimant.30 This may require primary payers to compile statistical data that is not readily available. Thus, all primary payers should start this process immediately. Lastly, all files may be submitted using Hypertext Transfer Protocol over Secure Socket Layer (HTTPS), Secure File Transfer Protocol (SFTP), or for large files, via Connect:Direct and the AT&T Global Network System (AGNS). Primary payers are advised to present these issues to their IT staff as soon as possible so that they may begin preparing for this process. Primary payers must review and, where necessary, revise, their initial intake protocols to ensure that they obtain all of the information they need to determine if a claimant is eligible for Medicare. Primary payers must designate an employee to serve as an Account Manager and serve as an administrative contact with CMS. Primary payers must work with their IT staff now to start developing software that will assist in compiling the data required by CMS. By referencing CMS’ Supporting Statement, Interim Record Layout, and this article, primary payers can determine what information is necessary and ascertain the most cost-effective ways to retrieve and compile this data. In addition, IT staff must also develop data transmission protocols and ensure that primary payers can properly store, transmit and receive large volumes of data. Primary payers should strongly consider retaining records for at least ten years as per the recommendation of CMS. Primary payers should turn to counsel, internal personnel, or both, and task them with remaining abreast of instructions and guidance from CMS. Primary payers must implement procedures to investigate and remain informed of any conditional payments by Medicare on any of their claims. Keeping track of any such payments will be necessary for a variety of reasons, including: (a) keeping a log of what costs may need to be repaid to Medicare, (b) calculating an appropriate reserve in handling the file, and (c) identifying whether excess carriers, if any, must be afforded notice of potential claims. Primary payers must develop training protocols to ensure that all staff charged with the task of reporting data to CMS are aware of the numerous formatting and technical requirements for submission of reports. In addition, forms and templates should be created to ensure uniformity and assist in compliance. Primary payers should develop internal procedures for preparing reports to CMS. Primary payers may consider creating a workgroup or division dedicated exclusively to CMS reporting. Alternatively, primary payers may wish to require each Adjuster to assume this task for each of his or her claims files. Primary payers should create internal guidelines to determine whether the creation of Medicare Set Aside Trusts are needed for a particular claim. Primary payers are encouraged to work with counsel in making these determinations. Primary payers must act diligently in complying with the MSPA’s reporting requirements. The alternative is exposure to substantial fines. Primary payers are encouraged to remain abreast of updates and instructions at <http://www.cms.hhs.gov/MandatoryInsRep/> and to communicate regularly with counsel regarding MSPA compliance. 1 CMS uses multiple acronyms to refer to parties that are responsible for complying with the MSPA’s reporting requirements. Some of these terms are Responsible Reporting Entities (“RRE”) or non-GHP entities (all RREs except for group health plans). Rather than use these terms, this article utilizes the term “primary payers” throughout this article. 2 This article does not address the obligations imposed upon Group Health Plans (“GHP”). GHPs are also subject to the MSPA’s new reporting requirements, and must commence reporting to CMS on and after January 1, 2009. 3 See Parasher B. Patel, CMS Memorandum to All Regional Administrators, Workers Compensation Commutation of Future Benefits, July 23, 2001. If a lump-sum compensation award stipulates that the amount paid is intended to compensate the individual for all future medical expenses required because of the work-related injury or disease, Medicare payments for such services are excluded until medical expenses related to the injury or disease equal the amount of the lump sum payment. 5 See Popolizio, Mark, Liability Cases and Medicare Compliance, June 2008, at p. 5, available at www.nqbp.com. 6 CMS defines the term “total settlement amount to include wages, attorney’s fees, all future medical expenses and repayment of any conditional payments by Medicare. Gerald Walters, CMS Memorandum to All Regional Administrators, Workers Compensation Medicare Set-Aside Arrangement (WCMSAs) and Revision of the Low Dollar Threshold for Medicare Beneficiaries, April 25, 2006. 7 CMS defines reasonable expectation to include three scenarios: (1) when the applicant has applied for SSD, (2) when the applicant has been denied SSD but anticipates appealing this denial or re-filing, and (3) where the claimant is 30 months away from the age of Medicare eligibility or where the claimant has End State Renal Disease at any age. Thomas L. Grissom, CMS Memorandum to All Regional Administrators, Medicare Secondary Payer – Workers Compensation (WC) Frequently Asked Questions, FAQ No. 2, April 22, 2003. 8 See Popolizio, Mark, Liability Cases and Medicare Compliance, at p. 4, (June 2008), available at www.nqbp.com. 9 See Glover v. Liggett Group, Inc., 459 F.3d 1304, 1306 (11th Cir. 2006) (quoting Cochran v. U.S. Health Care Financing Admin., 291 F.3d 775, 777 (11th Cir. 2002)). 10 42 U.S.C. § 1395y(b)(2)(A). 11 See 42 U.S.C. § 1395y(b)(2)(A)(i) (authorizing conditional payments by Medicare); 42 C.F.R. § 411.21 (defining the term “promptly” to means 120 days from the date of medical service or the filing of an insurance claim, whichever commences earlier). 12 Under the MSPA, the federal government can sue any entity for failure to reimburse Medicare. See 42 U.S.C. § 1395y(b)(2)(B)(iii). The federal government also has a statutory right of subrogation as to any Medicare beneficiary. 42 U.S.C. § 1395y(b)(2)(B)(iv). In addition, the MSPA also creates a private right of action that entitles parties to collect double damages where an entity fails to provide primary payment or reimbursement of covered medical costs. See 42 U.S.C. § 1395y(b)(3)(A); Glover, 459 F.3d at 1307. 13 The MSPA’s reporting provision is codified at 42 U.S.C. § 1395y(b)(8). 14 42 U.S.C. § 1395y(b)(8)(E)(i). 15 The focus of this article is on suggesting steps to comply with the MSPA’s reporting requirements. Other important topics, such as how to calculate a Medicare set-aside, are beyond the limited scope of this article. For a discussion as to whether tortfeasors can be subject to the MSPA’s requirements, see the article entitled “The Medicare Secondary Payer Act and Its Affect on Tort Cases”, Cole, Scott & Kissane, P.A., Litigation Quarterly (March 2008) at p. 7, available at <http://192.168.10.185/cskroot/articles/Anniversary%20Issue.pdf>. 16 42 U.S.C. § 1395y(b)(8)(D). 18 See 42 U.S.C. §1395c (2008); 42 C.F.R. §§405.340-341; Frazer v. CNA Ins. Co., 374 F.Supp.2d 1067, 1071 n.2 (N.D. Ala. 2005); Cooper v. Blue Cross and Blue Shield, 19 F.3d 562 (11th Cir. 1994). 19 See 42 U.S.C. § 1395y(b)(8). 20 See 73 Fed. Reg. 45013, 45014 (August 1, 2008); Supporting Statement at p. 1. 21 All bullet-point references are derived from Attachment D of the Supporting Statement. 22 Implementation Timeline, at p. 2. 23 Implementation Timeline, at p. 2. 24 Implementation Timeline, at p. 2. 25 Implementation Timeline, at p. 2. 26 Implementation Timeline, at p. 2. 27 Registration Process, at p. 2. 28 Registration Process, at p. 2. 29 Registration Process, at p. 3-6. 30 Registration Process, at p. 7. 31 Interim Record Layout, at p. 2 and see also Popolizio, Mark, CMS Releases “Interim Record Layout” Information For Reporting Under Section 111 of the MMSEA, October 2008, available at www.nqbp.com. 32 Interim Record Layout, at p. 4-6. 33 Interim Record Layout, at p. 7. 34 Interim Record Layout, at p. 7. 35 This suggestion was contained in See Popolizio, Mark, Liability Cases and Medicare Compliance, June 2008, available at www.nqbp.com. Mr. Popolizio’s has published several articles on MSPA compliance. A new strategy that Plaintiffs are employing, in an attempt to hold hospital surgical centers actively liable, is to contend that pursuant to the applicable common, statutory, and licensing laws of the State of Florida, hospitals and surgical centers have a non-delegable duty to provide medical care and services. Yet, the general rule is that hospitals do not owe a duty to their patients to provide physicians’ medical and surgical care. Under the common law, a hospital is not liable for the negligent acts of a physician who is not its employee, but instead an independent contractor.1 Plaintiffs who attempt to plead that a non-delegable duty is owed would not be successful under current Florida common law. However, Plaintiffs are now asserting that hospitals should be held liable for their physicians under a broad interpretation of certain Florida statutes and regulations. Florida Statute Section 395.002(13)(b) defines “Hospital” as “any establishment that regularly makes available at least clinical laboratory services, diagnostic X-ray services, and treatment facilities for surgery or obstetrical care or other definitive medical treatment…” Further, Chapter 395 authorizes the Agency for Health Care Administration (AHCA) to adopt rules and regulations to ensure that hospitals are operated consistent with established standards and rules.2 Rule 59 A-3.2085(4) of Florida’s Administrative Code requires each Class I, Class II, and Class III hospital providing surgical or obstetrical services to have “an anesthesia department, service, or similarly titled unit directed by a physician member of the organized professional staff.” Based on the statute and regulation, Plaintiffs have argued that a non-delegable duty of hospitals to provide non-negligent surgical treatment exists. 42 C.F.R. § 482.1 is another source that Plaintiffs are utilizing to impose a non-delegable duty on hospitals based on the hospitals participation in the federal Medicare program. This regulation is designed to ensure that medical services are provided in a safe and effective manner (even if those services are provided by independent contractors). It was promulgated by the U.S. Department of Health & Human Services’ Centers for Medicare and Medicaid Services to govern a hospital’s eligibility to receive payments from the Medicare program. In an effort to combat plaintiffs’ attempts to derive a basis for liability against a hospital from this regulation, defendants point to the legislative intent of the regulation. Such an analysis reflects that the underlying intent of the regulation was to set forth requirements for hospitals to participate in the Medicare and Medicaid Programs, not to give rise to a private right of action by patients who allege injuries at the hands of the physicians that merely occur in a hospital setting. While Florida appellate courts have been silent on the plaintiffs’ theory regarding 42 C.F.R. § 482.12, other courts have rejected the plaintiffs’ theory outright. In Acevado v. Lifemark Hospital of Florida,6 the court opined that the Medicare regulations do no more than require a hospital to staff its hospital competently. Any non-delegable duty of the hospital would be limited to providing competent physicians rather than ensuring non-negligent care.7 In Blackmon v. Tenet Healthsystems Spalding,8 the court held that the regulation does not purport to impose state tort liability on hospitals for the negligence of their independent contractors. Rather, it simply outlines the guidelines with which the hospitals must comply to receive Medicare. Finally, plaintiffs have relied on a contractual argument to attempt to impose a non-delegable duty upon hospitals. Under Florida law, a hospital may undertake to contract to provide certain types of care to its patients. If it does so, the contractual duty to provide such care may not be delegated to independent contractors even though the actual performance may be delegated. In Irving v. Doctors Hosp. of Lake Worth, Inc.,9 the court recognized that a hospital that undertakes a contract obligation to do something is not allowed to escape contractual liability by delegating performance to an independent contractor. In conclusion, while there is little support for a common law cause of action against hospitals and surgical centers, Plaintiffs have successfully brought statutory and contractual actions. 1 Pub. Health Trust of Dade County v. Valcin, 507 So. 2d 596, 601 (Fla. 1987). 2 § 395.1055 (1)(d), Fla. Stat. 3 955 So. 2d 1 (Fla. 4th DCA 2007). 6 2005 WL 1125306 (Fla. 11th Cir. Ct. May 5, 2005). 8 653 S.E. 2d 333 (Ga. Ct. Appl. 2007). 9 415 So. 2d 55 (Fla. 4th DCA 1982). 10 863 So. 2d 343 (Fla. 1st DCA 2003). 14 939 So. 2d 185 (Fla. 5th DCA 2006). 18 955 So. 2d 1, 9 (Fla. 4th DCA 2007). 19 Id. ; The surgical consent form was on the hospital’s letterhead. Once a settlement is reached, the tortfeasor who has settled with the victim will usually request that the victim sign a Release of All Claims. There are circumstances where there are multiple tortfeasors, and the victim may choose to seek compensation from all tortfeasors instead of holding the original tortfeasor responsible for all subsequent acts causing injury. This situation is prevalent when an already injured victim is injured further by a subsequent medical provider. However, an issue may arise if the original tortfeasor and the victim signed a Release of All Claims that releases all of the victim’s claims against additional tortfeasors. Can all additional tortfeasors prevail on summary judgment or can the original parties reform the Release of All Claims so that it states their true intentions? In Banks, the court concluded that any “unintended assignment” of the Banks’ claims against the health care providers was “cured” by the reformation.21 In Rucks, the health care providers’ motions were granted.22 The court affirmed the summary judgments since Rucks did not bring a separate equitable reform action.23 Many plaintiff attorneys are not aware that a separate action in equity is required to reform a release and rather attempt to challenge the release in litigation. In this case, the court should follow Rucks and grant the subsequent tortfeasor’s motion for summary judgment. The court should find that the victim released the subsequent tortfeasors because equitable relief was not obtained. 1 955 So. 2d 604 ( Fla. 5th DCA 2007). 9 541 So. 2d 673 (Fla. 5th DCA 1989). 15 McCutcheon v. Hertz Corp., 463 So. 2d 1226 (Fla. 4th DCA), rev. denied, 476 So. 2d 674 (Fla. 1985). 18 Banks, 955 So 2d at 608 (citing McCutcheon, 476 So. 2d at 676). 19 Banks, 955 So 2d at 608. 20 Newman v. Metropolitan Dade County, 576 So. 2d 1352 (Fla. 3rd DCA 1991). 21 Banks, 955 So 2d at 609. 22 Rucks, 541 So. 2d at 674-675. In 1972, the Florida legislature enacted section 725.06, Florida Statutes which places limitations on indemnification in construction contracts.1 Although this statute remained unchanged for eighteen years, in the last decade, it appears that the legislature has struggled with this notion of indemnification in construction contracts. As a result, the statute has gone through various changes. Whether a particular indemnity provision in a construction contract is valid largely depends on the year in which a contract was executed. Below please find a synopsis of the changes to date. In sum, when evaluating a tender of indemnification, a practitioner should first determine whether the indemnity provision is valid pursuant to the particular version of the section 725.06, Florida Statute that governs the execution of the subject contract. While an indemnity provision may, for example, contain the requisite consideration or monetary limitation it may still be invalid because another version of the statute applies to the particular contract. The operative fact for determination as to which version of the statute applies is the date of execution of the contract. 1 Section 725.06, Florida Statutes (1972). 2 Peoples Gas System, Inc. v. RSH Constructors, Inc., 563 So.2d 107 (Fla. 1st DCA 1990). 3 See, Westinghouse Electric Corporation v. Turnberry Corporation, 423 So.2d 407 (Fla. 4th DCA1983); Peoples Gas System, Inc.. v. RSH Constructors, Inc., 563 So.2d 107 (Fla. 1st DCA 1990). 4 423 So.2d 407 (Fla. 4th DCA 1982). 5 Pacific Nat. Equity Co. v. Montgomery, 367 So.2d 729 (Fla. 4th DCA 1979); Peoples Gas System, Inc.. v. RSH Constructors, Inc., 563 So.2d 107 (Fla. 1st DCA 1990.) and MacIntyre v. Green’s Pool Service, Inc., 347 So.2d 1081 (Fla. 3d DCA 1977). 6 Section 725.06, Florida Statutes (2000). 9 See generally, Paul N. Howard Co. v. Affholder, Inc. 701, So.2d 402, 404 (Fla. 5th DCA 1997). 10 Section 725.06, Florida Statutes (2001).